Wednesday: Board of Directors 5:30pm. Lodge Meeting at 7pm. Casual dress. TIME IS RUNNING OUT TO SIGN UP FOR THE CHARITY GOLF TOURNAMENT. PLEASE CLINK THE LINK BELOW FOR THE SIGN UP SHEET AND INFORMATION. PLEASE PAY YOUR DUES IF YOU HAVEN'T PAID THEM YET. REMEMBER IF YOU HAVE NOT PAID YOUR DUES YOU WILL NOT BE SERVED. WE RELY ON DUES TO HELP US PLAN THE BUDGET AND GET THROUGH THE YEAR. 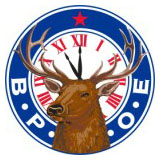 BEING PART OF THE ELKS AND PAYING YOUR DUES IS HOW WE KEEP GOING! IF YOU ARE UNABLE TO PAY DUE TO FINANCIAL HARDSHIP PLEASE CONTACT ONE OF THE OFFICERS TO SEE IF WE CAN HELP. YOUR INFORMATION WILL BE KEPT CONFIDENTIAL. ALEX PENA FOR DINNER ON FRIDAY! LOTS OF GREAT REVIEWS. Trudy Symanski is at Flatirons rehab after a fall.